I am already four months pregnant but I still go to work every day. Because of the fact that we don't own a car and even if we did, I wouldn't be bringing it to work because gasoline and parking are both expensive and I don't know how to drive, I just commute going to work daily. Unfortunately, sometimes it is not as easy as it sounds. My belly is not yet that big although when you look at it, the bump already shows. You just need to pay attention. Sadly, most passengers seem to overlook this fact. I ride on a jeepney on my work and on my home daily. There are times when it is easy to ride one, there are times when it is hard and there are times when it gets really annoying. Maybe I experienced the same things in the past but didn't mind so much as I wasn't greatly bothered by them anyway but now, I that I am, I just cannot let them pass. I need to be on my way to work at 4 AM. Riding a jeepney at this time should be easy as there should be only a few people riding them but unfortunately, I am mistaken by that. I usually encounter people with large bulks of things that they need to sell somewhere else. 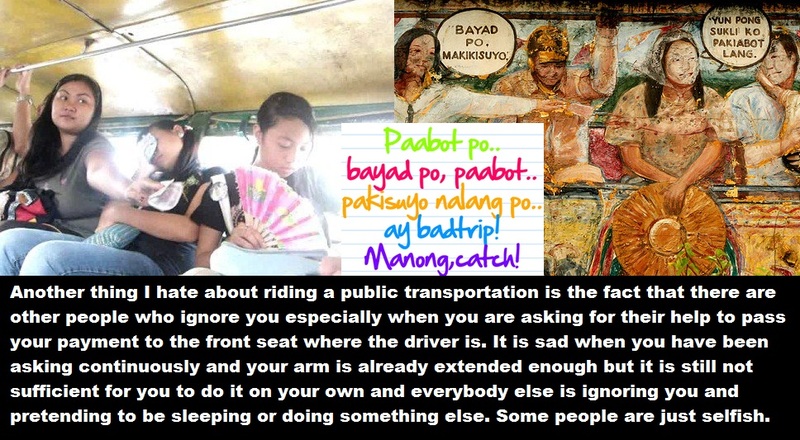 Too bad, they don't want to sit at the far side of the jeepney just behind the driver's seat. It is hard for a pregnant woman like me to actually find a seat whenever there are people who are like this. NOTE: I already added comments about the different pictures. If it is hard to see them, please click on the photos to enlarge. Thank you!